Photo courtesy of Asian Americans United. Education. Policing. Health care. Community safety. Bullying. Deportation. Immigration. Employment. These are just a few of the issues on the minds of Asian American and Pacific Islander (AAPI) voters in the swing states of Nevada, North Carolina, Ohio, and Pennsylvania, where registration efforts continue while simultaneously giving way to a broader mission of increasing civic participation, engagement, and activism. With Asian Americans comprising the fastest-growing racial minority group in the United States, the pressure is on to harness that political power in both local and national elections. In 2012, around eight million AAPIs were eligible to vote (47.9 percent of whom voted); for 2016, that number is up to approximately 9.3 million eligible voters. They are also the fastest-growing minority in some swing states, such as North Carolina, where their population has grown by 29 percent since 2010, according to a new report released by state and national AAPI civic organizations. AAPIs are now often a swing electorate in their own right, not a reliable voting bloc for either political party, but increasingly vocal and aware of how front-burner policy issues such as immigration, healthcare, and policing are and could affect them. They are more than twice as likely to identify as Democrats — even Vietnamese Americans, who have previously leaned Republican — and prefer Clinton over Trump at a 4-to-1 ratio, yet 1-in-5 voters still say they are undecided. According to the just-released National Asian American Survey (NAAS), conducted by the nonpartisan AAPI Data, they overwhelmingly oppose a ban on Muslim immigration, are divided on whether to accept Syrian refugees, oppose legalizing marijuana, and are split across generational lines as to where they get their news: ethnic or social media. What this means for AAPI civic groups on the ground is that the time is ripe to get out the vote. Video from the nonpartisan group, AAPI Data. Disaggregated data on AAPIs are rare, but show the nuance of communities. The notoriety that comes with being a battleground state also helps with raising awareness, says Vida Chan Lin of the Asian Community Development Council in Las Vegas, Nevada, where the final presidential debate was held. Nevada is home to over 285,000 AAPIs — the majority of them in Las Vegas — their population growing over 116 percent between 2000 and 2010, according to U.S. Census figures. 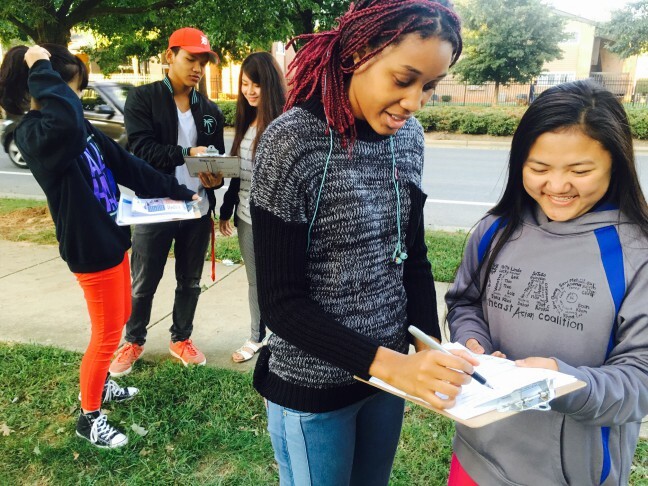 The first step to voter outreach is finding the voters. 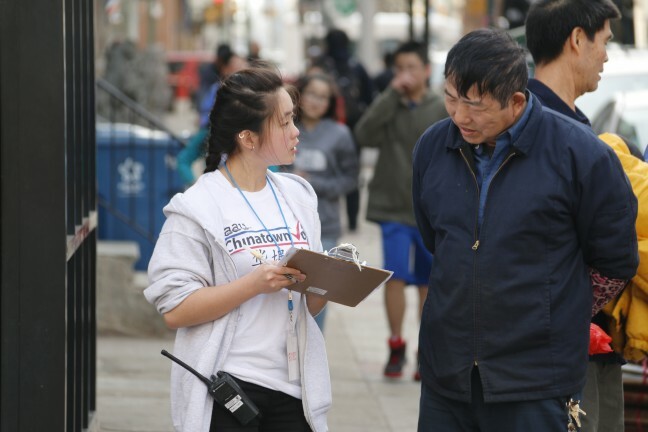 To do this, there are tried-and-true methods like phone banking, going door-to-door, and sending volunteers to community gathering spaces, but when targeting Asian American and older voters — many of whom face language barriers — organizers from each state we spoke with agreed: the best strategies are the ones that emphasize building trust. Come Election Day, going to the voters also means making sure they actually get to the polls. In Philadelphia, this means sending a volunteer or family member with new voters to translate and explain the ballot boxes. And in Cincinnati, Ohio, the nonpartisan, nonprofit Asian Community Alliance sees “a lot of new citizens who are clueless about what to do next with their citizenship, so we are doing voter presentations about ballot forms and ballot boxes. Next, we’ll follow up with immigrant and refugee populations to see who needs transportation,” explained Executive Director Arlene de Silva. Improved voter access also means overcoming language and technology barriers. For example, in Pennsylvania, new voter ID laws have made it easier to register by opening up online registration. This has been a boon for the state’s 408,000 Asian Americans and nearly 15,000 Native Hawaiian Pacific Islanders, who, as of 2015, made up around four percent of Pennsylvania’s population. But for North Carolinans, constantly changing voting laws have made it confusing for existing and new voters alike, advocates say. In 2013, North Carolina cut the number of voting dates, eliminated same-day registration, and introduced a photo voter ID requirement to go into effect in 2016, but after litigation, the ID requirement was blocked — although it still faces another appeal. Voter outreach has also been important for the Democratic and Republican parties nationally. Although GOP candidate Donald Trump got a late start just this September in appointing an Asian Pacific American Advisory Committee, he has been aided by a “permanent field program” established in 2013 by the Republican National Committee (RNC) to establish a network of on-the-ground advocates who are now active in voter registration efforts. Democratic candidate Hillary Clinton has her own national AAPI Outreach Director, Jason Tengco, overseeing programs in three states: Nevada, Pennsylvania, and Virginia. Tengco touted “strong support from community leaders on the ground” as well as “targeted outreach” via FAQ sheets in multiple languages and in-language AAPI phone banks. Only 30 percent of Asian American registered voters reported being contacted by either political party since January 2016, according to the NAA survey, which includes 1,694 Asian Americans and 261 Native Hawaiians and Pacific Islanders people surveyed. Of these, 48 percent said only Democrats reached out, 15 percent were contacted by only Republicans, and 35 percent heard from both parties. And out of those calls, “about 20 percent” were contacted in a language other than English or by someone bilingual. 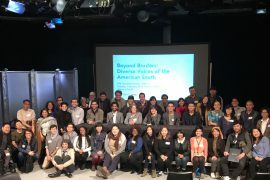 Collaboration between the dozens of ethnic groups in Asian America, each with their own unique culture and customs, has also been key to forming an AAPI political movement. In Las Vegas, this has meant an inaugural health fair put together by 27 different Asian American groups and, a college bootcamp and a mock caucus, and, on National Voter Registration Day this past September 27, a partnership between Asian American, Latino American, and black American groups to canvass the streets. 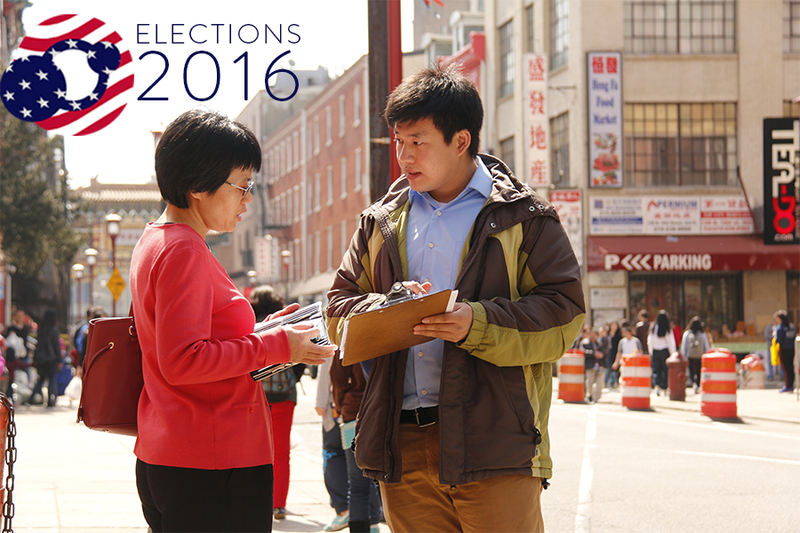 Asian Americans United in Philadelphia Chinatown tabling for the 2015 primary. In Ohio, it has manifested in a state-wide engagement effort known as the Voter Registration Engagement Project (VREP), funded by the AAPI Civic Engagement Fund and made up of civic groups in the cities with the largest AAPI populations: Akron, Columbus, Cincinnati, and Cleveland. Together, they offer classes in English, citizenship, civic engagement, and more to the state’s 250,000-plus AAPIs. And North Carolina has also established its own VREP: a coalition made up of the Southeast Asian Coalition (SEAC), North Carolina Asian Americans Together, and the Institute for Southern Studies. SEAC Executive Director Cat Bao Le says their plan includes a phone bank, voter registration canvassing, and a soon-to-be-released report full of data “about issues that impact Asian Americans in North Carolina, as well as the need for more civic engagement in the state.” SEAC is a nonprofit based in Charlotte that also helps build and train students to maintain youth farms. 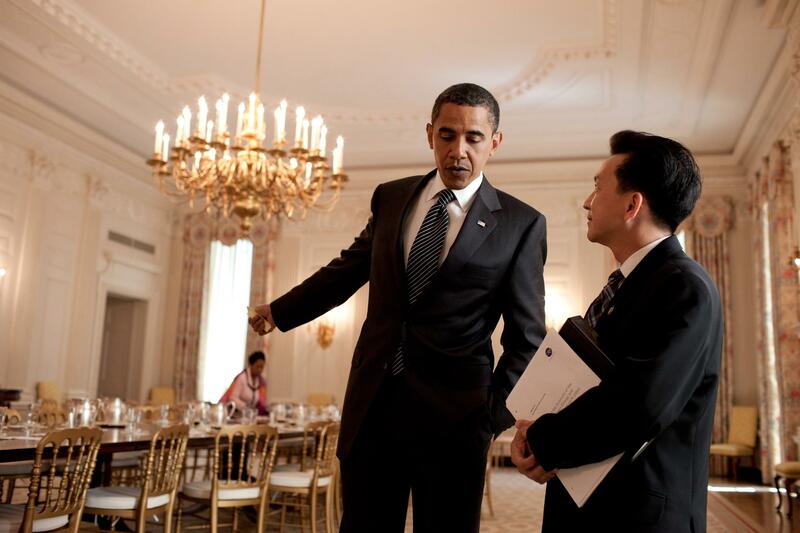 Wei Chen, civic engagement coordinator of Asian Americans United in Philadelphia, agreed. Heather J. Chin is a Brooklyn-based freelance journalist who writes about health, education, culture, and Asian American issues. Her work has appeared in The Philadelphia Inquirer, New York Press, Brooklyn Home Reporter, and Long Island Pulse. She is also a member of the Asian American Journalists Association. Follow @HeatherJChin on Twitter.